Editorial Note: This post is a slightly modified version of a post that originally ran on September 1, 2009. Thanks to readers who posted the nice comments over on my Facebook page about my 2010 Highlights video I posted here on Monday. A few of you asked for more information about Animoto, so I thought I would repost this tips blog post I had compiled previously with a few updates. Being that I have been a big fan of Animoto for about 2 years, (I was fortunate to meet the developers at a YouTube developers conference and got the inside scoop), I was thrilled at their latest technological feat -- going from a still shot/photo application to using video clips for their semi-automated video program application. I highly recommend Animoto as a great way to highlight events and send holiday greetings or cards. I also find it a solid program for compilations like an end of year summary, and a fun alternative to slide shows and photo essays, which do have their place, but can get a little humdrum. For full control over your videos and a more customized finished product, I still recommend Apple's iMovie program. I've been using the 4-year old version for a while now, and find it a great "starter" platform for creating short videos. Be forewarned that once your videos upload to YouTube, the quality goes down if you're not filming in HD. I've seen better quality with Vimeo and will probably do some exploring over there myself in 2011. Note: I don't recommend Animoto if you have a fair amount of text, or lengthy extended captions, as each text menu only holds about as many characters as a tweet. You're better off with a slide show, or posting photos and captions directly on your blog. 2. Click on "Create Video." Then select "Animoto Short," which is included with your free account. This produces a 30-second video, which uses 8-15 elements, such as text, images, and video, depending on the music you choose. 3. Next, select your images and video clips, via 3 sources: 1. upload from your computer, 2. select from animoto's own library, which is an extensive collection of images divided by category, or 3. upload from another source (for photos only), with selections including: Flickr, Photobucket, Facebook, Picasa. For video clips, it's best to upload super short clips - 10 seconds or less -- or else the upload process can be long, and a lengthy video can weigh down the overall effect. I've done about a dozen videos so far and have only a handful that include my video clips, since I rarely film clips that short and didn't want to re-edit clips for that length. 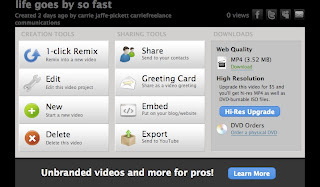 Animoto also provides clips for download, so you can check those out as well. 4. There is an excellent preview function which quickly lets you view your selections beforehand. You can also multiple select by holding down the apple key, if you're on a Mac. 5. An additional menu on the bottom of the upload screen lets you also add a text frame, rotate images, spotlight (this highlights a video clip or images with special effects), delete, or duplicate. Select Done when you have all your images. This is how your screen looks once you have uploaded your images. About 12 images or 5-8 second clips equals one 30-second video. 6.The Music menu is next. Either upload your own, or choose from the Animoto collection. I like to use the collection since I know it's already been licensed for this purpose and it can be time consuming to find free music for your videos. Animoto's collection is organized by styles, such as "Indie," "Featured Track," "Electronica," "Country," "Oldies," etc. Once you click on your category, a neat panel comes up with all your music choices, and a preview icon lets you listen to a clip before deciding. Select your song of choice, then select "Save and Continue." 7. Select your cover screen image - usually about 2 choices appear. Select Continue. 8. Fill in your video title and description in the information box, then select "Create Video." 9. You will get a screen that tell you your video is rendering, and when it's ready you get a message in your e-mail, so you can move onto other projects while you're waiting. I only waited about 5 minutes for my video to render - a big time improvement over the last version. The Animoto Sharing Menu offers a wide variety of options, including a cool greeting card format. 10. You get a link in your in-box when the video's done, as well as a link for viewing that takes you back to animoto's site. Now it gets really fun. On the upper right are links to upload to Twitter, Facebook, and email. Below the video screen is a comment box, making the interface highly social. And, if you select the blue video toolbox icon on the lower right, you get a wide variety of options, including uploading to your blog (it didn't work on Blogger, I had to go to YouTube), upload to YouTube, remix so that an entirely different rendition is created, etc. A few notes...for an additional $5.00 you can get a high definition video. Also, for $30 a year, you can get a video of unlimited length and using quite a few more videos and images. I did the upgrade and felt I really needed the additional time on the video and that 30 seconds was too short, but it's up to you. Try it, and let me know how it goes in the comments here! Carrie, this is fantastic information about Animoto. I am definitely going to sign up for a free account, and I'll consider upgrading. Thank you so much for the great information. Happy New Year!